This memoir by Amy Silverstein is a must-read for everyone. Whether or not you think you like memoirs, I don’t care – put this on your list, right now. 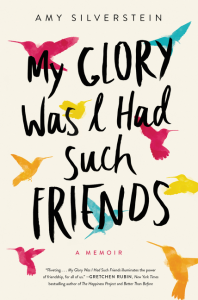 My Glory Was I Had Such Friends is about life, death, love, and friendship. As Amy sits in a hospital bed with a failing donor heart on the other side of the country from her home in New York, nine of her friends sign up for time slots to come and stay with her in California as she waits for a second transplant. Her first transplant was when she was only 26 years old, and now at 50, that donor heart is so diseased, Amy is dying quickly. Each of the friends that comes has a unique personality, a unique relationship with Amy, and a unique way of dealing with Amy’s situation. Amy sees all of these friends in a completely different light: that of a dying woman. Their friendships reach new levels of deepness, and the ways they interact with each other is heartwarming and, at the same time, heartbreaking. As Amy deteriorates, she sets a date: a date when she’ll ask that her pacemaker be turned off, and await whatever comes after that, which would be certain death after a matter of days or hours. As she counts down to that date while holding out hope for her donor heart, her friends become of more importance to her than ever, and her interactions with them are so touching. As I read this book, I felt myself forming insights into my own friendships and relationships. It was amazing and beautiful and I highly suggest this book to everyone. I’m a stickler with handing out 5-star ratings, but this one I’d give 6 in a heartbeat. 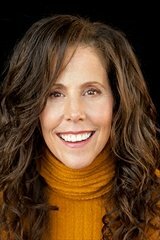 Find out more about Amy at her website, and connect with her on Facebook. Displaying My Glory Was I Had Such Friends HTML.txt. Books like this, ones that give the reader a new perspective on the world or own their own life, are real treasures. I’m glad you picked this one up!